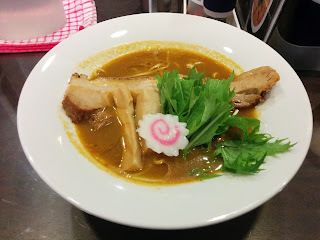 A friend of mine had long suggested I visit Marotei, a shop that is not strictly a ramen shop, but a curry noodle shop. I ordered the standard dish, curry noodles. 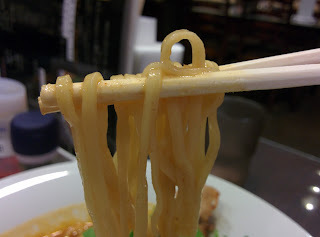 Unlike other curry noodle dishes I've had, this was not sweet but rather savory, not too thick but with a smidge of spice and a peppery roughness. The noodles were long and flat, and there was a single bridge of chashu, laying along the bowl's diameter. At the end throwing in a bit of cayenne pepper added a final kick. I recommend it for any curry lover.